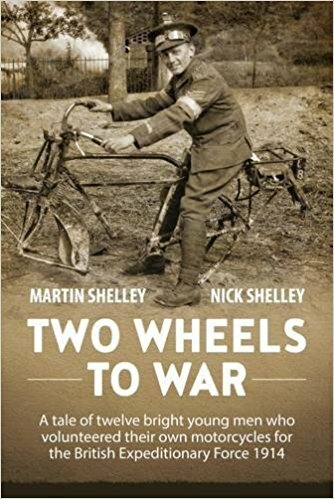 Two Wheels To War is a scholarly but entertaining look at the largely forgotten world of the motorcycle despatch rider in the early months of the First World War, then a new phenomenon in the field of conflict. At the heart of the book is an illustrated and annotated edition of the underrated and initially uncensored classic first published in 1915, Adventures of a Despatch Rider, written by Captain WHL Watson, one of the well-educated young men who volunteered for the Signal service. He and over 400 other motorcyclists were sent to France, some mounted on their own machines, direct from the recruiting office. Sometimes uncomfortably close to the fast evolving action, Watson and his colleagues played a little known but key part in the early campaigns at Mons, Le Cateau, on the Retreat and on the Aisne. They accompanied the BEF returning to the north in October 1914 when the Western Front extended to Flanders, enduring the harsh winter that followed. His book, which initially escaped scrutiny by the censor, was a graphic and particularly well written account of the reality of war from the Retreat from Mons to the First Battle of Ypres. To illustrate his classic prose, we have unearthed a treasure trove of contemporary photographs, mainly taken by three of his fellow despatch riders in the 5th Signal company, Pollers, Sadders and Cecil Burney, using the soldier s camera, the VPK, as the iconic Vest Pocket Kodak camera became known. As well as Watson's book itself, we continue his story until April 1915, when he was wounded and repatriated to England. His book was based on his letters home which were serialised in Blackwood s Magazine (the famous 'Maga'), an Edinburgh-based publisher responsible for other classics of the time such as The Thirty Nine Steps and The First Hundred Thousand. While convalescing from a shrapnel wound, Watson was persuaded to edit his letters into a book which was released in late 1915. Now commissioned, Watson resumed writing (but in a less personal style than before) about his experiences as an officer commanding a Cyclist's battalion, articles which appeared in Maga under the title Tales of a Gaspipe Officer. Plans to publish these in book form were thwarted by the censor who had by now spotted that his first book had slipped through the censor's net and had been withdrawn awaiting review. These Maga articles are republished here for the first time since 1916. Our introduction offers a new perspective on their story how the Signal service hurriedly recruited and sent to France more than 400 motorcyclists with their own machines. We have also researched the biographical details of the twelve despatch riders of 5th Signal company. These reveal their real identities, hidden until now behind the nicknames they used such as "Huggie" and "Spuggy" and the ironically named "Fat Boy". The appendices describe the motorcycles and equipment the despatch riders used, and finally there is a database of the 400 men who went to France in this role in 1914, which will prove an invaluable tool for their descendants researching their forebears.